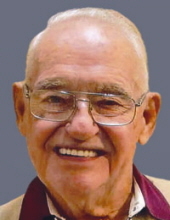 LEESBURG, IN-George Junior Eden, 91, passed away on Thursday, November 29, 2018 at his home in Leesburg, Indiana. He was born August 25, 1927 in Hartsville, Tennessee. He moved to Indiana in 1942 and raised his family in Alexandria. For the last several years, he wintered in Leesburg, Florida and summered in Leesburg, Indiana. He was employed by Delco Remy and retired in 1987after 38 years. He also owned E & H Machinery in Alexandria. George was a member of Alexandria Eagles #1771 where he served 3 terms as President. He was one of several members who helped relocate the Eagles Lodge to its current location. Anyone who knew George knew that he was all about Family. He taught love, acceptance, forgiveness and the value of hard work. His legacy will live on through each life that he touched. Preceding him in death were his wife of 48 years, Barbara Eden in 1994; his parents, George Eden and Clara (Cox) Eden and 8 brothers and sisters. Services honoring George’s life and legacy will take place at 11 am on Monday, December 3, 2018 in the Noffze Funeral home, 501 North Harrison Street, Alexandria with Pastor Jerry Young officiating. Interment will follow in Forrestville Cemetery in Boone Township. Friends may call at the Noffze Funeral Home from 4 pm to 8 pm on Sunday. The Alexandria Eagles Lodge will conduct a memorial service at 7:30 pm on Sunday in the funeral home. Memorial contributions are suggested to the Eagles Children’s Fund with envelopes provided at the funeral home. Noffze Funeral Home is honored to care for George and serve the Eden family. To send flowers or a remembrance gift to the family of George Junior Eden, please visit our Tribute Store. The Alexandria Eagles Lodge will conduct a memorial service at 7:30 PM on Sunday in the funeral home. "Email Address" would like to share the life celebration of George Junior Eden. Click on the "link" to go to share a favorite memory or leave a condolence message for the family.